CAMARILLO, Calif.--(BUSINESS WIRE)--Semtech Corporation (Nasdaq: SMTC), a leading supplier of high performance analog and mixed-signal semiconductors and advanced algorithms, today announced the addition of Laird Connectivity, a global leader in wireless connectivity solutions, to the Semtech Design Partner Program. The program, which debuted in September 2018, streamlines the creation and deployment of LoRa-based IoT solutions by connecting customers with experienced designers that understand LoRa® devices and wireless radio frequency technology (LoRa Technology). Laird’s comprehensive Engineering Services capabilities, coupled with Laird’s growing Sentrius™ LPWAN ecosystem of LoRa-based products, enables the acceleration of LoRa-based IoT solutions for any customer. Laird’s Engineering Services offer customizations of standard product offerings as well as full end-to-end product development. Combined with a state-of-the-art testing and certification laboratory, Laird has the expertise and tools to support LoRa projects and ensure successful deployment. 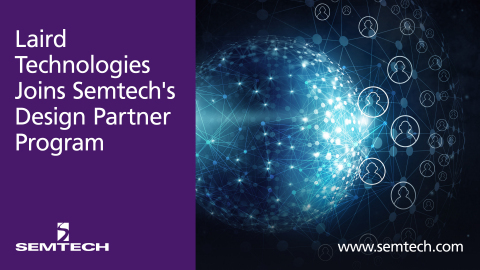 For more information about the Semtech Design Partners Program, visit here. Laird Connectivity simplifies the enablement of wireless technologies with market-leading wireless modules and antennas, integrated sensor and gateway platforms, and customer-specific wireless solutions. Our best-in-class support and comprehensive engineering services help reduce risk and improve time-to-market. When you need unmatched wireless performance to connect electronics with security and confidence, Laird Connectivity delivers — no matter what. For more information, visit https://www.lairdtech.com/. All statements contained herein that are not statements of historical fact, including statements that use the words “will,” “designed to” or other similar words or expressions, that describe Semtech Corporation’s or its management’s future plans, objectives or goals are “forward-looking statements” and are made pursuant to the Safe-Harbor provisions of the Private Securities Litigation Reform Act of 1995, as amended. Such forward-looking statements involve known and unknown risks, uncertainties and other factors that could cause the actual results of Semtech Corporation to be materially different from the historical results and/or from any future results or outcomes expressed or implied by such forward-looking statements. Such factors are further addressed in Semtech Corporation’s annual and quarterly reports, and in other documents or reports, filed with the Securities and Exchange Commission (www.sec.gov) including, without limitation, information under the captions “Management’s Discussion and Analysis of Financial Condition and Results of Operations” and “Risk Factors.” Semtech Corporation assumes no obligation to update any forward-looking statements in order to reflect events or circumstances that may arise after the date of this release, except as required by law.